Beginning tomorrow Thursday, Sept 28, by 10 AM, the northwest off-ramp will open. 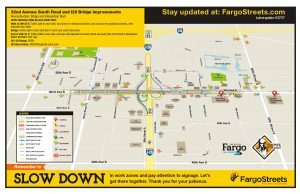 Southbound interstate traffic exiting from I-29 will use the widened northwest ramp to enter 32nd Avenue S traffic at the bridge. This exit ramp will only carry drivers wanting to enter the westbound driving lanes off 32nd Avenue S. Drivers wanting to travel eastbound on 32nd Avenue S (towards the hospital) will continue to use the newly constructed southwest loop ramp that opened to traffic this summer. 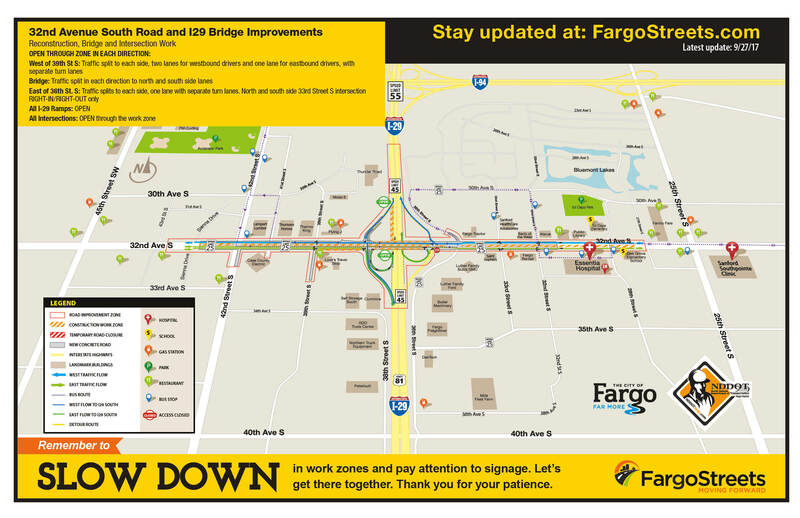 Also tomorrow morning, traffic will split across the I-29 bridge to allow work in begin in the median area of the bridge deck. Westbound traffic will use the second driving lane from the north side, which will allow crews to work on the northern lane. Eastbound traffic will be in the second lane from the south side to allow crews to finish painting the south side barrier wall. Throughout the rest of the project work in October, there will be intermittent closures and traffic control may be shifted for short periods of time on 32nd Avenue S. Crews will be continuing to work on installing permanent striping, finishing medians, lighting, traffic signal, seeding, and sidewalk work. Permanent traffic signals are now operational at the 32nd Avenue intersections of 45th and 39th Streets. This week crews for the I-29 bridge will move their operations to mostly under the bridge to finish remaining project work. Short-term lanes closures on the interstate may occur in either direction outside of peak travel times as safety barricades are shifted or removed, and directional and overhead signage is installed on or for the bridge. Drivers are asked to pay attention and eliminate distractions. West of 39th Street S to west end: Traffic carried on outside driving lanes, two lanes for westbound drivers and one lane for eastbound drivers, with separate turning lanes in each direction. East of 36th Street S to east end: Traffic carried on outside driving lanes, one lane in each direction with separate turn lanes. Intersections: The 33rd Street S north and south side intersection is right-in and right-out only. All other intersections open.